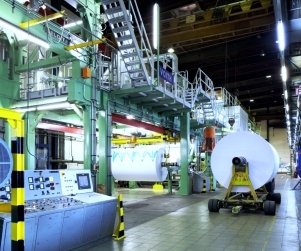 April 1, 2019 - Mitsubishi HiTec Paper announced that it has successfully commissioned a new quality control system — an investment of about EUR 1 million — on coating machine 21 at the company's Bielefeld mill in Germany. According to Mitsubishi, the recently commissioned Honeywell quality control system includes several measuring frames of different equipment and system peripherals for precise process control. “We will be able to combine the special coating units even better and make more efficient use of them,” said Kai Borenius, Head of Machine Technology at Mitsubishi HiTec Paper. “In doing so, we not only achieve a further increase in process quality and production flexibility, but ultimately also an optimized product quality. This applies both to our traditional product areas such as thermal or inkjet papers, but especially to our new product areas such as the environmentally friendly barricote barrier papers for food packaging." The Bielefeld mill has the capacity to produce 150,000 tonnes per year of specialty papers, i.e. coated inkjet papers, thermal papers, carbonless papers, label papers and barrier papers.